Heather McGrath is featured in this spotlight article, as a graduate student participating in the ECCE program at UNB since 2015. She recently participated as a member of UNB’s team in the latest ECCE App Challenge. Below, Heather shares her experiences working with GIS during her studies at UNB. I began with a review and understanding of Hazus Canada. Hazus is a GIS based quantitative risk assessment and decision support tool for natural hazard risk mitigation and emergency management, developed in the U.S by the Federal Emergency Management Agency (FEMA) and adopted for use in Canada. 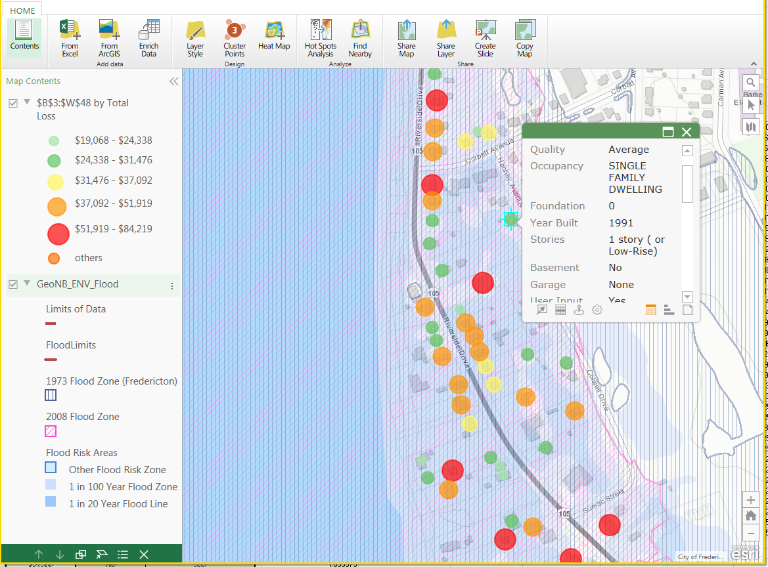 Hazus Canada is compatible with ArcGIS 10.0. Specifically, I was looking at the Flood Model. This program comes with a National dataset, thus you can use it ‘out of the box’, but to generate better/more accurate results, uploading user defined data is recommended. The schema of the required data is very specific and data needs to match the fields, domains, etc. exactly to ensure a successful import. 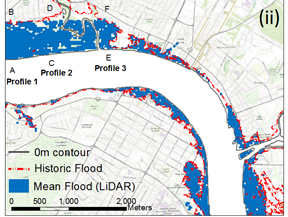 ArcGIS Model Builder was used to amalgamate datasets from local and provincial levels of government into a single, comprehensive dataset for flood loss estimation computations which matches the Hazus schema exactly. This project was presented as part of the Esri Canada 2015 GIS Scholarships, of which I was a winner. To view the Poster supporting this project, click: Model Builder Poster. 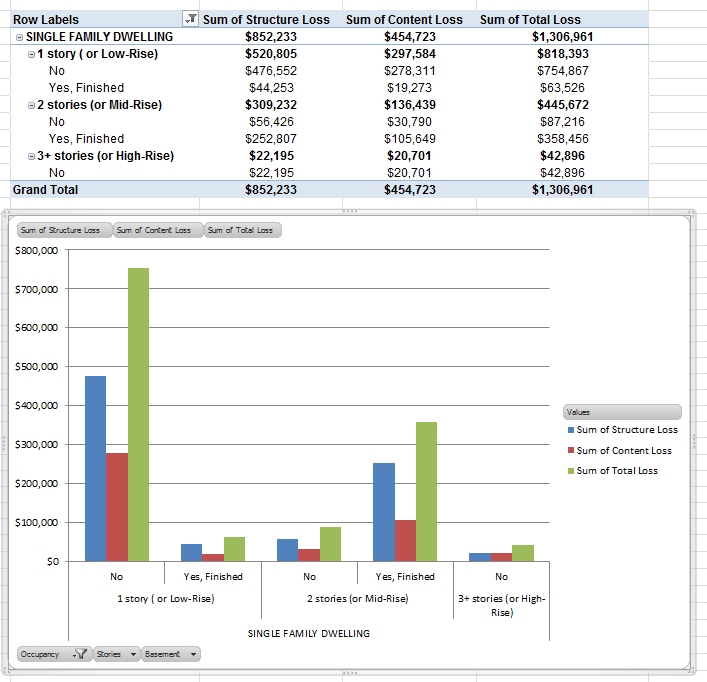 Using many of the underlying tables from Hazus, a user friendly Excel Worksheet was created which allows a user to input building details and a water level for estimation of building value and flood damage. If you want to download and try out the calculator, click here. User friendly tools, which are built using Python, have been developed which utilize open source data including: elevation, delineation of watersheds, river bodies and flow channels, river gauges, intensity duration frequency curves, etc. These are accessed on-demand based on the user input location and flood scenario. A sample below shows an example of 5 river gauges, with water depth readings from max flood level of the 2008 flood in New Brunswick. These data have been interpolated via kriging to create a water surface. LiDAR digital elevation data are then subtracted from the water surface to identify those pixels which are flooded in this scenario. The digitized historic boundary is included for reference. There are multiple providers of world-wide elevation data accessible through REST API services, including Esri, Google and Bing. The Esri dataset provides the most comprehensive metadata of these. A python script has been created which takes user input, in the form of a bounding box, requests the best resolution data available for a region and builds a DEM, and other derivative products such as slope and aspect maps as requested. One potential use of this elevation data is the ability to have a user digitize on-screen potential mitigation measures, such as sandbagging along a shoreline (to raise the shoreline) or other flood prevention strategies, and then re-build the DEM with these vertical adjustments. This modified DEM can then be input to the simplified flood models to recompute vulnerability.